Leading this month's news was US Gold's "World Cup Carnival", the official World Cup '86 game. A team of programmers had been working on it for 6 months and US Gold boldly claimed that it would "reach new standards in football simulation". Sadly it would turn out to be one of the most infamously terrible games of the time, and was just a repackaging of an older title. Mastertronic had a "Flash Gordon" game in the works which received mixed reviews, though the C64 version was easily the best and featured a great Rob Hubbard soundtrack. The software house also teased the impressive sounding "Molecule Man" for the Spectrum. Gremlin assured Monty Mole fans that they wouldn't have to wait much longer for the next instalment in the series (though there were no details). 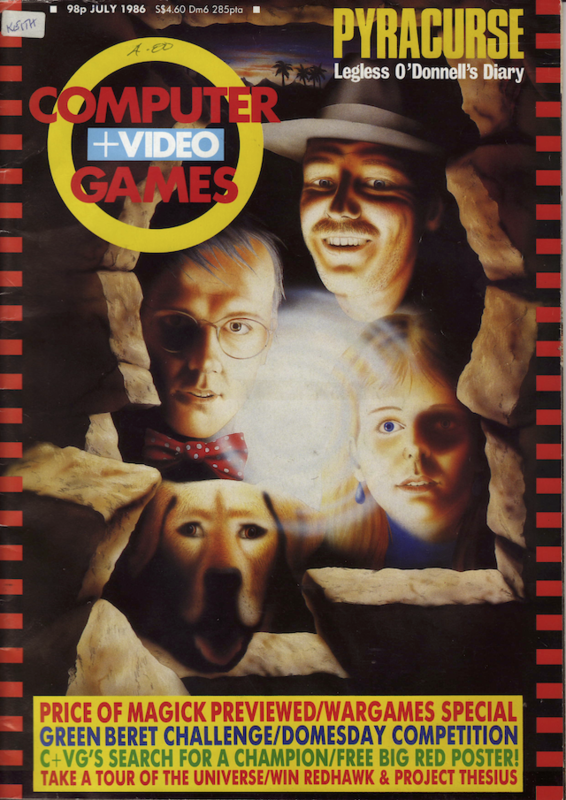 "Jack the Nipper", "Future Knight" and an unnamed game which C&VG described as "very interesting" would make up the rest of their releases for the year. Steven Crow, who won C&VG's Programmer of the Year award, had joined Hewson and his first game would be "Firelord". Infograms had setup Republic which would be its UK arm. The launch title "Mandragore" promised a graphic adventure of "epic proportions" and would come in a twin cassette pack due to game size being over 260K. Macmillan Software had secured the 2001AD license and brought in the talented folk at Design Design to handle the development of "Rogue Trooper". They also picked up the license for new kids TV show "The Trap Door" which Don Priestly would be programming (and a mighty fine job he did). English Software had almost finished up work on "Knight Games", their medieval take on sports games. Tony Takoushi raved about "Leaderboard". I remember scratching my head when I saw a golf game topping the charts, but as soon as I got to play it I realised what all the fuss was about. Hewson was busy, with "Pyracurse", Andrew Brook's follow up to "Uridium", "Alleykat", and a new game from Steve Marsden and David Cooke (creators of "Technician Ted") called "City Slicker". Fourteen year old Garrick Stark won Activision's game design contest which would see him travel to San Francisco and a commercial game developed based on his design. The game was called "Starblade Quest" and Activision said it would be finished in 3 months. The only mention I can find of it is this game for the Atari. The Electric Pencil Company had branched out from games and developed software for the BBC micro used to display band info on Channel 4's "Chart Show". Irish software house New Concepts were still teasing "Surf Champ" which they reckoned would be the "ultimate sports simulation" and "as near the real thing as possible". They also said it would be "revolutionary" in that it wasn't controlled via joystick or keyboard (it was actually a little plastic surf board which sat on top of the keyboard). Rumours were that US Gold would be bringing "Gauntlet" to home computers. "Fist II" - sequel to "Way of the Exploding Fist" - was due to hit the shelves in August. C&VG had a bit more info on "Big Trouble in Little China" and were a little red faced that they had repeatedly called it "Big Trouble in Little Shining" in last month's issue. Dr Stephen Badsey, a researcher on the BBC's Soldiers series and former staff member of the Imperial War Museum, took a look at the state of computer war games and what the future might hold. Brendon Kavanagh wrote an introduction to Play By Mail games and recommended a bunch of his favourites. Marshal M. Rosenthal visited the impressive "Tour of the Universe" experience at the CN Tower in Toronto. There was a review of joysticks using "Uridium". The Kempston Pro 5000, Euromax Wiz Card and Quickshot 7 faired the best. "The Planets" Martech - Spectrum 8/10 Game of the Month "It's not instantly addictive and won't appeal to arcade addicts currently into Commando/Uridium - BUT Planets does present a true challenge and will reward anyone who takes the time to REALLY play the game." "Mermaid Madness" Electric Dreams - C64 7/10 C&VG Hit "It's a long time since a 'cute' game like this appeared on the scene - and a welcome change from all the terribly serious stuff around at the moment." "International Karate" Archer MacLean/System 3 - C64 10/10 C&VG Hit "When 'The Way of the Exploding Fist' came out it was considered brilliant. The truth is that International Karate is better than Fist. If only System 3 had managed to get the game out at the same time it would have been fascinating to see them fight it out in the charts." "Shogun" Virgin - C64 8/10 C&VG Hit "Although the game is entertaining, it didn't hold my interest for long. If you had the time to sit down and plan your game activities properly, it would appeal more." "Ballyhoo" Infocom - All disk 10/10 "Once more Infocom have come up with the goods, to maintain their position as number one adventure creators. The wealth of information provided, and the almost human quality possessed by the computer when one of their games is loaded, never ceases to amaze me." "The Price of Magick" Level 9 - C64/Spectrum/MSX/CPC/Atari/BBC 10/10 "Price of Magick has the usual special Austin brand of humour, and the unique Austin association of ideas in the puzzles. It is big, full of atmosphere, and entertaining." "The Very Big Cave Adventure" St Brides/CRL - C64 10/10 C&VG Hit "There are jokes, and unexpected highlights all the way." "Murder Hunt" Bodkin Software - Spectrum 10/10 "This is an interesting game, rather like exploring a detective story for yourself, and more adventures of the Rev. Murphy are promised."